I recently found this recipe for potato and leek soup on Pinterest and was so excited to give it a try. Up until I made this soup, I had never cooked with (or tried) leeks before and I was eager to see what all the fuss was about. Leeks kind of look like giant scallions and have a much milder taste than regular onions. There is often dirt trapped inside the layers, so you need to make sure to clean them well before using. 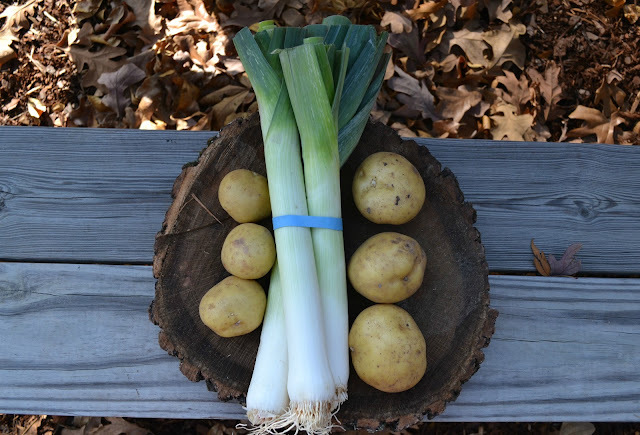 The easiest way to do this is to cut the leeks in half lengthwise, then slice into 1/4" half moons (only use the white and light green part - the dark green part is very tough and dry). Put the sliced leeks into a big bowl of cold water and shake around a bit. The leeks will stay at the top while all the dirt and sediment sinks to the bottom of the bowl. After a few minutes you are left with clean leeks ready to go. Add leeks and potatoes to a large soup pot and add just enough water to cover. Add several pinches of salt & pepper. Bring to a boil, then reduce heat and simmer for 30 minutes, or until potatoes are tender. At this point, I like to use my immersion blender to blend the soup slightly. It breaks up some of the potatoes and gives the soup a really great creamy texture. Honestly, it is hard to believe how good the soup tastes. I was very skeptical because I thought with only adding water, the soup wouldn't be very flavorful. Boy, was I wrong! I think it was even better reheated the next day. If you've never tried leeks before, I would highly recommend this recipe as an introduction to the wonderful world of leeks. I predict many more bowls of this soup in my future! We LOVE potato leek soup! We use leeks in a creamy cauliflower leek soup as well (they taste even better fresh from the garden! )We make our potato leek soup a little different, we saute the leeks with a couple cloves of crushed garlic in a little olive oil before we add the potatoes and water. Then we add a bay leaf while it cooks. Yum! We love leeks so I'm sure this would be a hit here - I will try it next week before the Thanksgiving festivities. Thrifty too! It looks delicious! I always hear 'leeks' on the food channel shows but I've never tried them. This isn't time consuming either which is always good for me. This is the second GREAT soup recipe I've seen today. I'm sharing it. Thanks for posting! LOL! First time Ibought a leek, had to call a friend who had written a cook book to ask what to do with them! I've always avoided potato-leek soup recipes because they usually add cream or milk. Yours sounds perfect though, and I can't wait to try it! Hi Tammy.. I love this soup.. It is the first one of Julia Childs that I tried and loved..
Yours looks so good that I may need to make it again soon.. This recipe does intrigue me! I haven't tried leeks, but this does look really good! Yum! I think I'll have to make this. I just made creamy potato soup and it was delish! I make a very similar soup, the only difference being that I use chicken or vegetable broth and you're right, it is delicious! Your potato & leek soup looks delicious! I don't tend to buy leeks too often, but this is soup weather. Have a great day. My family love soups, this recipe is so easy I need to give it a try! Thanks for sharing it! I love leeks! Your soup looks great. I think this may be dinner tomorrow - there are still leeks in the garden and I love the simplicity of this recipe!! Never had leeks; going to try this recipe. Thanks, gal! Thank you for sharing! Can't wait to try! I've always wanted to try leeks, I know they're good for you, but just don't know how to cook them. I'd love to try this recipe. I've never cooked with leeks, I love trying new things! Thanks for linking up at Worthy Wednesday link party. Hey, it looks great! We have used leeks a time or two and they are pretty tasty. This looks perfect for a nice cold afternoon in front of the fire. This actually looks and sounds great! I've never tried leeks before but every time I pass by them at the store, I think "man, I've got to find a recipe for these..." so thank for this! I also like easy soups that just use water because I don't always have broth on hand, and I don't buy the strore bought kind. I'm pinning this and making this weekend.. I used leeks in a dish called colcannon that has sauteed leeks and scallions mixed into boiled potatoes. All smashed happily together with salt, pepper, and butter! One of my favorite St. Patrick's day dishes. I love leeks! They are great for making homemade veggie stock, I use them a lot :) Love the soup, looks yummy!